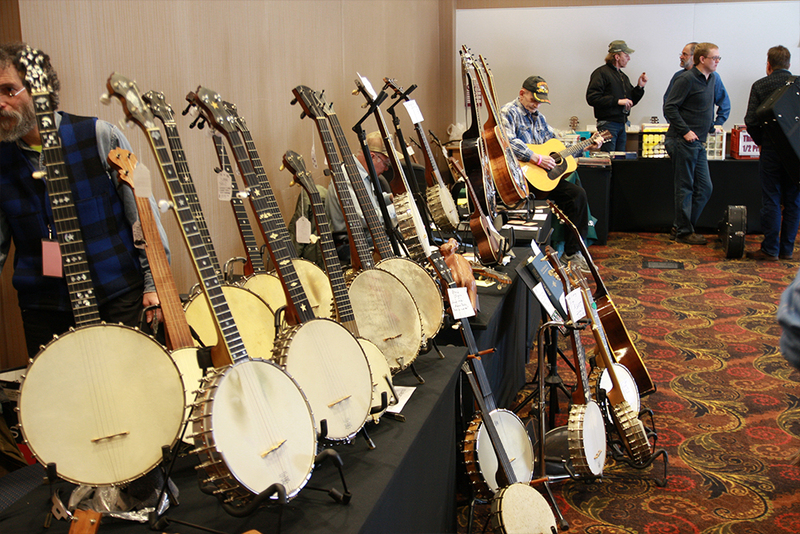 Registration is now open for event exhibitors for the 2019 Winter Bluegrass Weekend. Hall Open: Friday 6-10 p.m., Saturday 10 a.m. - 7 p.m., Sunday 10 a.m. - 3 p.m. Setup: Friday, March 1st 4 - 6 p.m., Saturday, March 2nd 9 -11 a.m.. Sunday, March 3rd, 9-10 a.m.
Ticketing: One weekend ticket is included with a table purchase. Additional weekend tickets are available for purchase. Equipment: Tables are standard 6' and space includes two chairs. Electricity is provided upon request at no additional charge but there are a limited number of electric spots available. Check-In: Vendors will check in at the Registration table to receive badges and space assignment. Security: Vendor room is monitored during event and locked during off hours. Payment: can be made online or by check. If paying by check, mail to the address below. Note that registration is NOT complete until payment is received and all payments must be received by February 21st, 2019. No refunds.